Appalachian Mountain Club News: Views Worth Protecting: Tell EPA to strengthen the health and visibility standards! Views Worth Protecting: Tell EPA to strengthen the health and visibility standards! 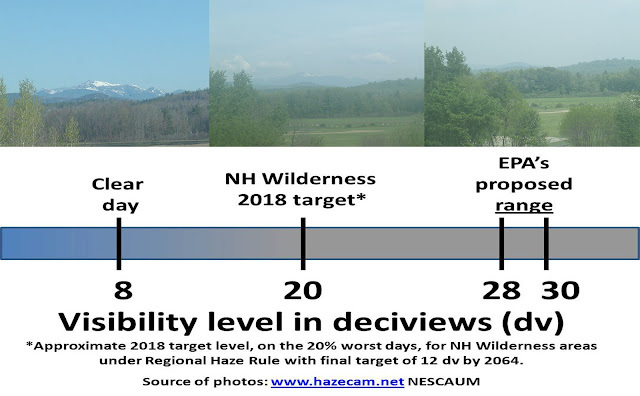 Views of Mount Washington under different fine particulate matter pollution concentrations and associate deciview levels. Whether soaking in a valley view between mountain peaks or witnessing a 360-degree mountain top vista, most hikers feel a sense of wonder when they look out on distant surroundings afforded by their ascents. AMC believes that clear views are worth protecting. We have worked for strong Clean Air Act (CAA) laws that reduce air pollution, e.g. fine particulates, which cause hazy views and negatively affect healthy outdoor recreation. There is an opportunity to comment now on the EPA’s proposed changes to the particulate matter national standards that could improve our health and our views. Review the EPA proposal to change the current National Ambient Air Quality Standards for Particulate Matter. Review AMC’s Fact Sheet (PDF 132 KB) on ozone and fine particulate pollution. Submit written comments by August 31, 2012 by emailing: a-and-r-Docket@epa.gov and denoting “Docket EPA-HQ-OAR-2007-0492” in the subject line. Attend the public hearing July 17, 2012 in Philadelphia, PA. See details here. (PDF 181 KB). Document the visibility on your hikes or when visiting one of our backcountry huts.